Sometimes the stories we write as journalists don’t develop with the depth or the complexity that we would like. We face deadlines. We have limits to our sources. Sometimes, we touch on something sensitive that we don’t know exactly how to handle it. 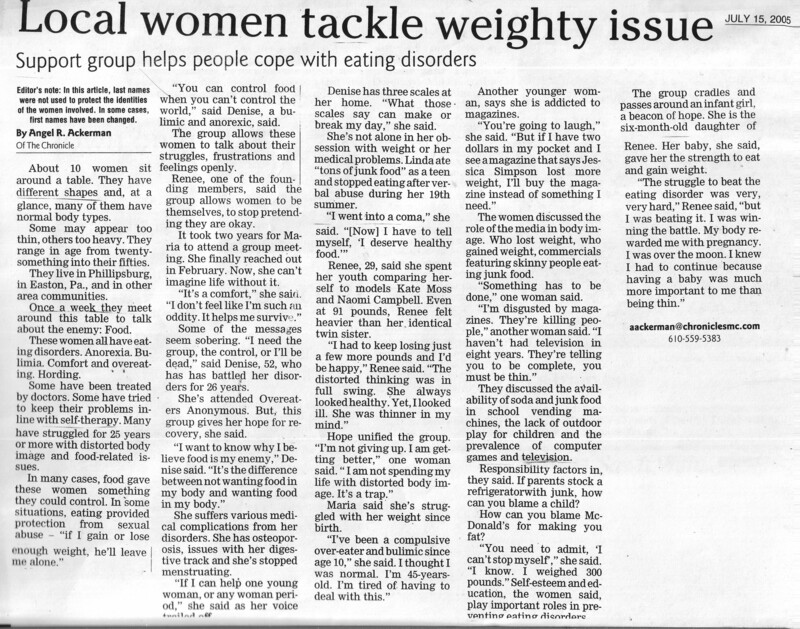 One such case I wrote involved a family living with HIV; another was this one, about a group of women who gathered as an eating disorder support group. This story is not my best written, and I apologize for the cut on the bottom of the scan. I worked hard to provide enough of a voice that various people could connect to these women, but not enough information as to identify them. That is a challenge. Let’s face it. The world stereotypes and judges people and these women had a strength and a willingness to make a difference. They hoped, as I hoped, that their story would help any other women facing similar issues, doubts or feelings of inadequacy. I don’t know if it helped anyone. I don’t know if it made anyone stop and think. It certainly didn’t change any societal perceptions, but I hope that maybe it touched one person who needed it.